Our Anniversary celebrations were a great success! 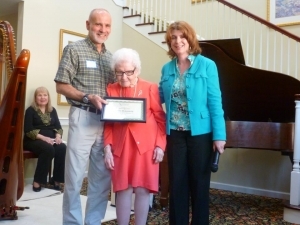 On Thursday May 17 we hosted local officials, surrounding health care professionals and others at a cocktail event to honor our 10 years of serving local Seniors, and to thank the community for their support over the years! We also honored our 10 year employees and resident, Ms. Jennie Urbanowski, with special recognition of gracing us with their presence at RiverCourt since we opened! Lady J performing "The Proper Patient"
RiverCourt welcomed Lady J. (Janet Parnes) who performed a lively performance of “The Proper Patient”. 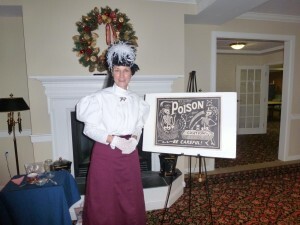 Our residents really enjoyed hearing about home remedies and medical practices from the mid to late 1800’s! The presentation sparked a lively discussion amongst the residents about their own memories of home remedies used by their families, particularly when they were children! It’s always great fun when Lady J. comes to visit!! Today RiverCourt’s Director of Dining Services, Chef Rick Kendall, performed a culinary demo for our residents and some staff too! 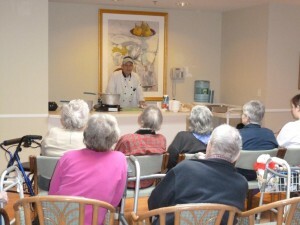 There was a full house watching as he prepared a delicious Lobster Newburg, which everyone had the opportunity to taste. Delicious!! This is just one of Chef Rick’s specialties which he loves to prepare for the residents of RiverCourt.